Italians love to celebrate – the small and big things in life. They also love art – in all its facets. So, what happens when these two things come together? Exactly! The celebrations will be extra big. As soon as the summer starts, the country is full of festivals, celebrating modern and classical art. Music, fireworks, theatre and dancers make the events an unforgettable memory. To get inspired for your next painting holiday in Italy, we picked the best summer festivals from our Italian destinations for you. 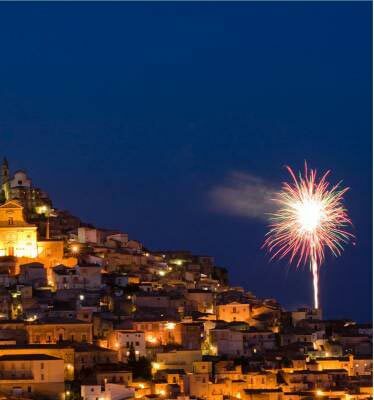 The Sicilian Summer Fest in Capaci takes place in the heart of the city – every day from 6 p.m. to 1.30 a.m. It is an annual festival that offers plenty of activities related to music, dance, visual art and comedy. And, on the last day of the festival, visitors can take part in a very special event: An interactive medieval show gives them the opportunity to play the tug-of-war and other typical medieval games for free. The Puccini Festival focuses on classical art by celebrating Italy and its prestigious opera. The summer festival in Tuscany was created in 1930, in memory of the famous composer Giacomo Puccini. Here, his masterpieces such as Madama Butterfly, La Boheme and Turandot will be played in the open air and can be listened to right next to the romantic Massaciuccoli Lake. The highlight of the Italian summer festivals is the International Film Festival in Venice. Organised by the Venice Biennale, one of the most prestigious contemporary art institutions in the world, the city will open its gates to host international celebrities for the 71st time. This year the focus will be on more than just one type of art – visitors will be able to experience dance, visual and contemporary art exhibitions, theatre, architecture, music and much more! The Venice Film Festival is one of the oldest and most celebrated festivals in the world and this year nearly 40 countries will be represented. 21 judges will decide on the best films, actors and directors of the year – judges being the English actor Tim Roth and the French musician Alexandre Desplat. So, if you do feel inspired now and you cannot wait to go on a summer escape to Italy, we have the perfect solution! Flavours Painting Holidays in Italy provide beautiful surroundings and inspiring tutors to stir one’s creative imagination. Whether you are painting for the first time or are more experienced, you will relish the experience of working from life, “en plein air”.